Though it’s an abstract concept, teaching colors is one things we all teach our children at an early age. One of the reasons why I chose for it to be first in this year’s learning themes is because it spans all things, meaning we can continue to talk about colors in each of the other themes. This makes color a valuable idea to know. And while my own 14 month old may not fully understand it yet, this is a pervasive concept that I am sure she will have mastered by the end of the year. Like I stated before, I am ahead of the game in terms of the theme calendar because I want to be able to post my successes, failures, and ideas in advance to help you plan and prepare for your own week of learning. 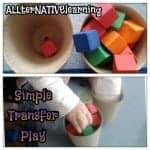 The purpose of the learning themes is to keep an enthusiasm for learning alive through the year and introduce children to the world around them. In planning your weeks, remember to be creative and scour the resources in your ow n home to make your experiences unique! For the most part, any toy will do for the colors unit. Just make sure that it’s vibrant and each color is clearly defined. We have several puzzles that each piece is a certain colors, even our music table has bright, vivid colors. One of our favorite colors toys that we could even take on the go is a Haba Magica Rattle. The name is somewhat misleading because it’s not a traditional rattle. But it’s a great wooden toy that works on dexterity. My daughter has played with it for the past year and really likes it. Brown Bear, Brown Bear, What Do You See? This is undoubtedly a classic children’s book that many of us already have (maybe even multiple copies). It is great for colors because each animal is a different color. My First Colors Board Book This is one of my FAVORITE colors books because it also includes shades and metallic colors, which are often overlooked when talking about colors. Sneakers, Sneakers! is an easy-to-read book for both tots and emergent readers. It’s great for colors because it shows different shoes and their colors without a lot of other distractions. Crayola Colors Leave it to the color experts to have some great resources, Crayola just has some great materials for teaching colors. One of my favorite things about this is, like the sneakers book, every page also has a crayola to link back that abstract idea that a color is a description and not an object/that the same object can be different colors. Stickers! I found in the dollar bin at target some crayola-shaped books of stickers for Red, Blue, Yellow, and Green. 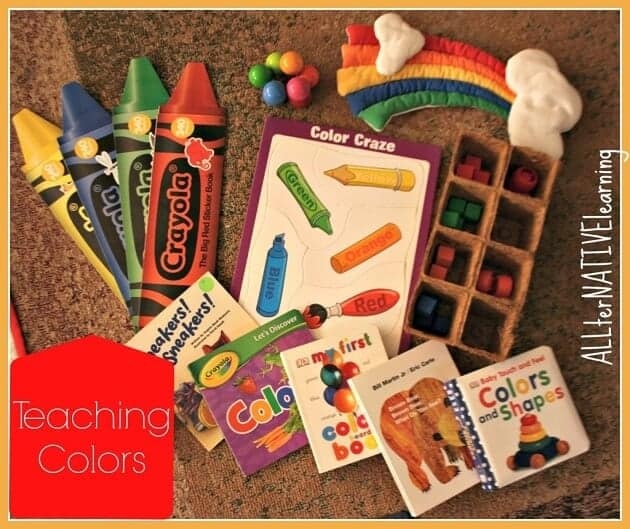 It’s great fun and practice for fine motor skills, but also reinforces color since each book only has one color for all its stickers. Colorful Bath Water. While I am not usually a fan of food dyes, these weren’t consumed, but helped with the learning process. In fact, we had a lot of fun mixing primary colors in the tub. We did color-themed baths where the water was the color of the day and all the toys were too. We also colored on the walls with our Sud Smart Bath Crayons. Sorting. Whether you use craft cubes, pom-poms, or even food pouch lids, you can use flow pots and buckets to sort colors. This makes a fun fine motor game, but also reinforces the different colors. Collect 3-6 small items that are the same color and put them in the bag. I only did one busy bag this week just because there were so many other options to explore color. Mine was red and included a small red pot with a few red cubes to play the transfer game and then some red paper, pen, and stickers. I did switch it up and have a few other items at different times in the week so that it was the same color, but a new bag in a way. For us, there are still a lot of local places with Christmas lights up. We drove around and enjoyed the lights with each other pointing out the different colors. There are also a couple of local companies that have rainbow lights on their buildings that we could visit. I wanted to start the week with the primary colors. Since all colors are derived from those three, it was a great jumping off point. Then ending the week with metallics and shades was a great end point as well. We could mix in shades with primary colors to show how they changed. Each day we wore the color of the day which was a fun way to start each morning and work on the practical life skill of getting dressed. Finally got a chance to get on and check out your plans! Really loving these ideas. I’m thinking I’ll wait until next week to start just so I can have a full week on colors. Thanks for doing this! No problem. I definitely love doing it and sometimes, it really is accountability to make sure I am investing time in Cassie as I should 😉 Hope it really helps and inspires some great ideas for your family. I look forward to chatting with you more soon! I don’t know why I hadn’t actually seen your website before when we “met” on the KBN now but I’m kicking myself about all of this wasted time! A friend sent me a link to your planner/schedule and it was everything I’ve ever wanted but didn’t know how or where to begin. I plan on tweaking it to suit our life/schedule/kids but I can’t wait to begin! I’m going to start with colors I think, and love and appreciate that you are working a week ahead in order to share with us what worked for you and what did not. Thank you! Keep doing what you’re doing!! Haha, but you can start ANY TIME! I am glad that you stopped by and that it will help you so much. 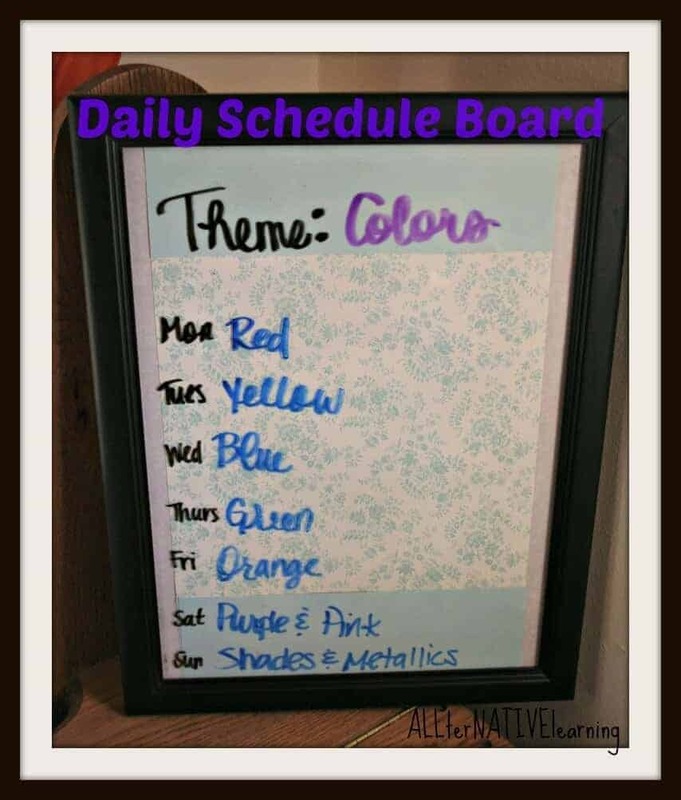 It’s one of my main ways to stay accountable to my daughter and keep her on a learning schedule. My goal in publishing was definitely to inspire others to find ways to incorporate it into their own lives as well. SO definitely tweak and adjust as needed 🙂 And thank you SO MUCH for the kind words and encouragement! Thank you so much for this! I started this with my two-year-old son today, and it was great! We look forward to following your suggestions each week! Thank you so much for your website. We are on week 1 doing colors so I want to thank you for the inspiration, ideas and the program! I work around my crafts and activities but your program is such a great guide!